New to Collage Salon or interested in trying a new service? Download our $10 gift and book your reservation today! Let Collage Salon pamper you any day! Gift certificates available, call or stop in! Refer a Friend and Receive 20% off Aveda Products! We love our guests and want more just like you! 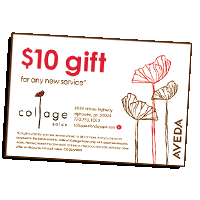 When you refer a friend to Collage Salon, we’ll give you a gift for 20% off of Aveda products as our way of saying thanks. To receive your gift, your friend must come in to experience a service with us and mention who referred them or bring in their referral card.